I am a graphically inclined person for the most part and always have had an interest in scrapbooking. The problem is that I never had the time to dabble in scrapbooking (digital or otherwise). When I had the chance to try the software Digital Scrapbook Artist 2, I was extremely excited. This was the perfect excuse for me to try my hand at digital scrapbooking. Since I am a novice at digital scrapbooking and do not have experience with the original Digital Scrapbook Artist software, I am writing this review from a novice's point-of-view. Please take two minutes to watch this overview of Serif Digital Scrapbook Artist 2 . . . This software was much more powerful than I expected. I am able to use other graphics programs (although mostly self-taught), but it took me awhile to explore this one. There were some things that were intuitive and easy to achieve, such as selecting a theme and a layout, dragging and dropping elements and photos onto your page, resizing, using the special effects, and selecting brushes. Below you will find a ready-made scrapbook layout and what it looked like after I modified it . . .
Below is a page I created with elements from the same theme, but I started off with a blank page . . . If you are like me and do not have experience with either the original Digital Scrapbook Artist software or other digital scrapbooking programs, then I recommend that you take advantage of the tutorials offered by Serif. 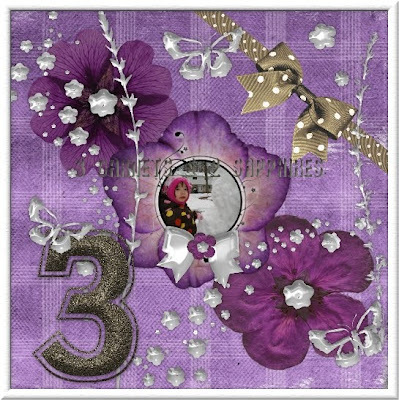 You can find video tutorials for Digital Scrapbook Artist 2 on the SerifVideos Channel on YouTube. Digital Scrapbook Artist 2 is available for purchase right on the Serif website. You can order the boxed software or download the program for $49.99. Serif even offers download protection for an additional $6.99 to eliminate the risks of not having a physical copy. You can also purchase this software on DaisyTrail.com and Amazon.com . Thank you to Serif for sending us a sample copy of this software free of charge to base this review upon and for providing an additional copy for our contest prize. One lucky reader will receive a boxed copy of the Serif Digital Scrapbook Artist 2 software, which retails for $49.99 . 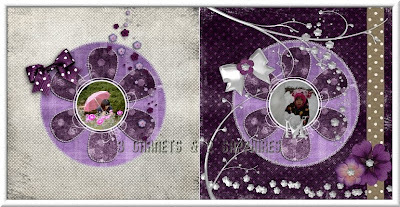 Take a look at the different scrapbooking tools and techniques this software offers. Then leave a comment telling me which tool or technique are you most excited to try. You MUST do this to be eligible to win this contest. 3) For 10 extra entries, blog about this contest linking back to this post AND Serif.com/scrapbook/ . Then come back here and leave TEN separate comments with the link to your blog post. 11) Add my Blogoversary Celebration tag to your blog's sidebar. Then leave a separate comment with the link to your blog. This contest will be closed on Monday, March 29th, 2010 at 11:59pm EST. A random number drawing will be held shortly after. The winner will be announced here and will be contact via email or through their blog. If the winner does not respond within 48 hours, a new number will be drawn.